Mountimer offers time planning and measuring when moving in rugged terrain like mountains and rocks. It allows you to make a schedule and then, during the trip, you can see whether you are going too fast or slow, according to it. It's designed for climbing, multi-pitch rock climbing, mountaineering, via ferrata, mountain biking, or whenever your journey takes to rugged terrain, with multiple stages, and you need to make sure to be at the right place at the right time. The application is designed to have minimum energy consumption. 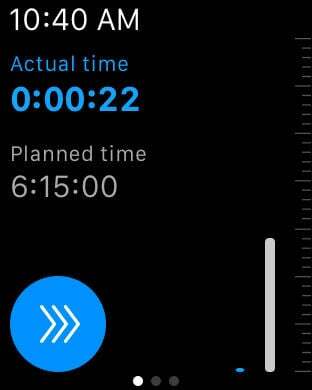 If you aren't looking at the lighted screen, it runs quietly in the background, and the communication between the watch and the phone is kept to a minimum, saving the battery of both watch and iPhone. It's designed for one-day trips. For example, when staying at one base (mountain cabin, etc.) and we head to nearby destinations within a day. * Manage the routes created. Routes can be grouped into sub-groups and those into groups. * Attach three images to each route and can quickly display them on the watch. 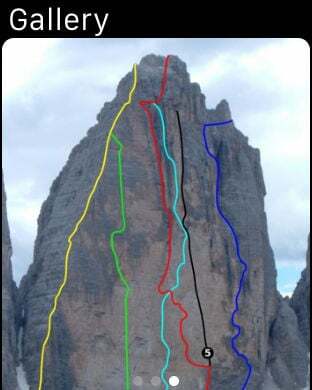 * Schedule each of the stages of the route, and the route as a whole. * Measure time from the moment you start moving on the route and to monitor any deviations from the schedule. The deviations can be monitored both within a stage and the route as a whole. Mountimer contributes to your safety when moving in the mountains. 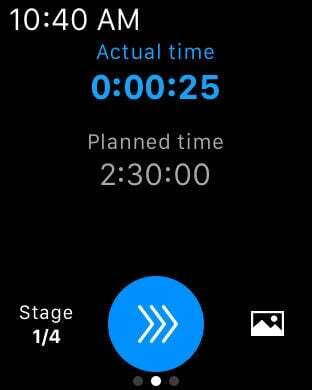 With the application, you can plan the time of each stage, and these time periods are automatically added together so you can see the time scheduled for the entire route. This tells you when you have to hit the road so you can be on time that day. It may also help you figure out which stage you will need to do faster, and you may also realize that a route is too difficult for you; and you can choose another, perhaps, shorter one. This is the most effective safety measure. Safety begins in your head. Mountimer clearly shows it to you and helps you watch how a situation develops, whether you are in time that day or delayed. You have a clear overview of the situation, which is the basis to make the right decision.